Requests for comment sent to Blue Lake Power LLC were not returned by Friday evening. Blue Lake Rancheria Energy Director Jana Ganion said in a teleconference held by The Biomass Monitor that the Blue Lake biomass plant, which resides about a half-mile from the tribe’s land, has incurred hundreds of violations under the federal clean water and air acts. “These violations have resulted in all kinds of settlements and consent decrees and fines, none of which at any point have resulted in real compliance with the Clean Water Act or Clean Air Act standards,” she said. She said the same may occur in the most recent litigation filed against the company by the U.S. Department of Justice and North Coast Unified Air Quality Management District in March. According to court records, the biomass plant was in operation between 1987 and 1999 before ceasing operations until 2008. When the plant restarted in 2010, the lawsuit alleges Blue Lake Power LLC did not obtain appropriate Clean Air Act permits and did not install pollution control devices to reduce carbon monoxide, nitrogen oxide and particulate pollution as required under a previous settlement agreement. The newest new settlement agreement between Blue Lake Power and the Department of Justice that was revised in September would require the plant to install new and repair existing equipment to its boiler to reduce emissions, which is estimated to cost the company about $800,000. The agreement states that the U.S. Environmental Protection Agency estimates these repairs will result in the following emission reductions: 226 to 301 tons per year of carbon monoxide, 13 to 25 tons per year of nitrogen oxides, and 5 to 10 tons of particulate matter per year. The agreement also requires Blue Lake Power to pay a $5,000 civil penalty to the United States and the air quality district for permit violations and contribute $10,000 to the district’s Wood Stove Incentive Replacement Program, which works to install cleaner heating devices and in homes that use wood stoves. The agreement is currently under consideration by the U.S. District Court. Ganion has been critical of this settlement, questioning how the company will pay for $800,000 worth of repairs if it stated it was too financially strapped to pay more than a $5,000 penalty. The settlement agreement follows a 2011 settlement agreement between Blue Lake Power and the air quality district in which the company paid nearly $1.4 million in fines for 123 air quality violations, according to the settlement document. Part of those fines were required to be used for equipment upgrades to reduce emissions, according to the agreement. The Blue Lake Rancheria intervened in the lawsuit last month and is recommending against the settlement agreement for the court to revoke the plant’s operating permit. While the tribe has its own 175-kilowatt biomass gasification generator as part of a collaborative energy program with Humboldt State University and the Redwood Coast Energy Authority, Ganion said that the tribe has “zero plans” to provide biomass at a larger utility scale that would be in competition with Blue Lake Power LLC. While noting biomass does provide a renewable energy source that uses natural fuels that could feed forest fires to instead power homes, Ganion said that research has found clear links between biomass plants and respiratory diseases in nearby communities. The Blue Lake Rancheria initially supported the biomass plant, Ganion said, as it was promised that it would not impact the health of residents or the environment. But as ash began to fall on tribal members’ homes and cars, Ganion said their view began to change. Ganion criticized the plant for receiving millions of dollars’ worth of clean energy subsidies while also being fined millions for emission violations. Blue Lake Power was also sued in August for alleged Clean Water Act violations in federal court by the Garberville-based environmental advocacy nonprofit the Ecological Rights Foundation. 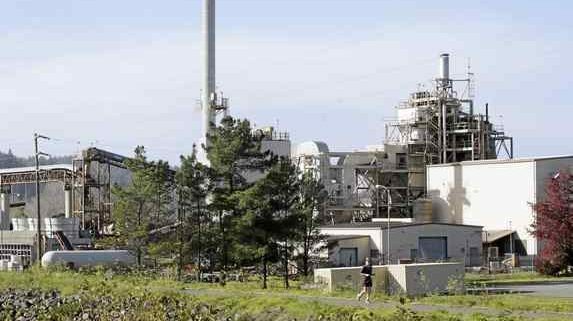 Humboldt County’s proposed community choice aggregation program, which would give the county and participating communities the ability to choose which sources of energy they buy power from and set competitive rates with local utilities, is eyeing biomass as a potential power source. 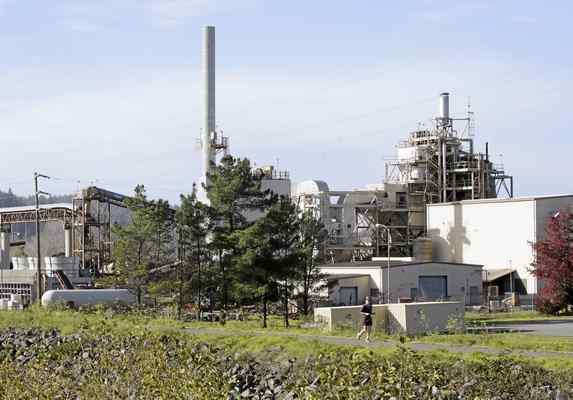 Redwood Coast Energy Authority Executive Director Matthew Marshall, whose organization is managing the program, said they have sent out requests for power purchase agreements and expects all three local biomass plants to submit one by the mid-December deadline. Marshall said environmental factors will be taken into account when they review the proposals in early January. “Our review team will be looking at a range of factors, not just price,” he said. Meanwhile, more than 100 Blue Lake residents have signed a petition calling for the city council to revoke the power plant’s ground lease should the company default on lease payments or violate fire and building codes. Mann said the main focus of the petition is to prevent pollution. Ganion said there is technology available that would nearly eliminate all particulate matter emissions and significantly reduce other emissions in biomass power plants. “The problem is they, of course, require investment,” Ganion said. Blue Lake Power Under Fire from Residents, Tribe over Alleged Pollution Violations, by Will Houston, Eureka Times-Standard, November 18, 2016.